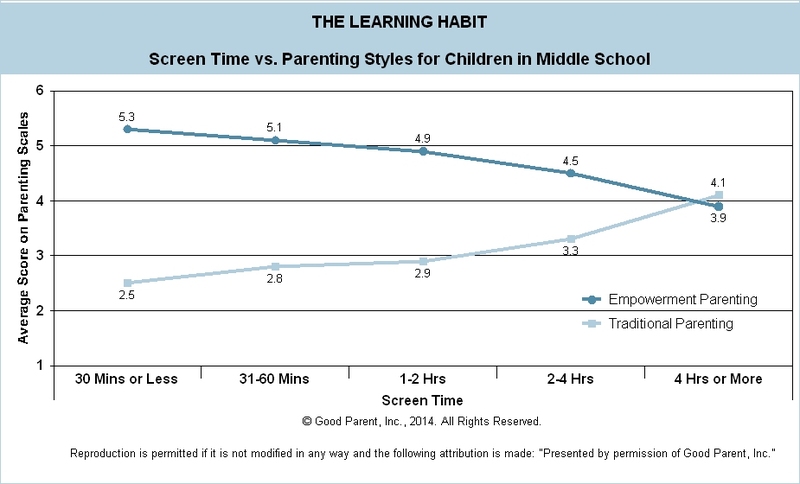 Parenting Styles vs. Screen Time - Good Parent Inc. 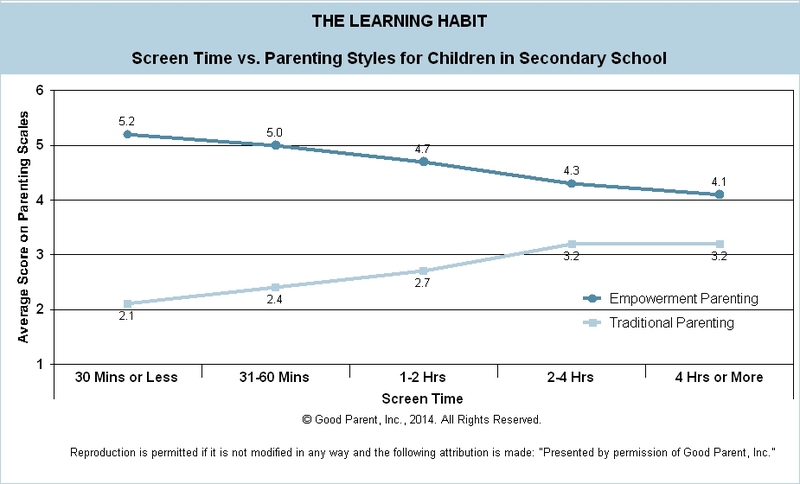 In the Learning Habit Study, we examined Parenting Styles and Screen Time. Parenting Styles were broken down into two categories. Traditional Parenting places emphasis on correcting or punishing unwanted behavior. It was also characterized by reduced communication between parents and with the child. Empowerment Parenting included a productive flow of communication among parents as well as with the child and a measure of confidence in the child’s capacity to make appropriate choices. These Parenting Styles were compared against against Screen Time, which was a calculation of the amount of time a child spends per day on video games, watching television, and texting. For this analysis, we only focused on middle and secondary school levels but across both grade levels, parents who indicated high rates of Traditional Parenting techniques had children with significantly higher amounts of Screen Time. Conversely, parents who indicated high Empowerment Parenting techniques had children with significantly lower amounts of Screen Time. While there is plenty of evidence and existing research to state that too much Screen Time in general can be unhealthy, when added with other factors resulting from Traditional Parenting techniques such as social and emotional volatility, lower grades and physical effects such as trouble falling asleep, the high rates of Screen Time can be significantly detrimental to a child’s overall health and well being.